This is another difficult review to write, because I know a lot of my fellow readers loved it and I… didn’t. I think I’ll go back to the dot point format for this one – it really does help with collecting thoughts. Katsa is an Graced assassin – gifted with an ability to kill and trained from a young age to murder and mutilate at her King’s behest. In her teens, Katsa starts to see that her King’s purposes are often less than noble, and she forms the Council – a group of sympathetic friends who carry out missions to undermine the power-hungry Kings. A Council mission to find and rescue a kidnapped noble from Lienid kingdom becomes even more mysterious when a young Lienid man, Prince Po, turns up. Who was responsible for the kidnapping? Katsa and Po set out to solve the mystery. The start of Graceling is a little slow – lots of courtly machinations and mucking about, but once it all got going, the story itself was fantastic – an epic quest across sweeping countryside, with plenty of obstacles to overcome described in gruelling detail. Several kingdoms, each with distinct cultural variations (at least the Lienids seemed quite different from the others) and an interesting collection of characters. The Graces were an interesting magic system – there is a seemingly inexhaustable variety of talents that people are gifted with, but each person is only Graced with one. There seemed to be quite a few people Graced with fighting, but what happens if you’re Graced with something like cooking, and you don’t actually want to be a cook? Too bad! I loved Raffin! He seemed like such an absent-minded but loyal friend, I thought it was such a shame when he was left behind and we don’t hear from him for the rest of the book! I did like Po, too. He’s passionate, romantic and a lot more likeable than Katsa. 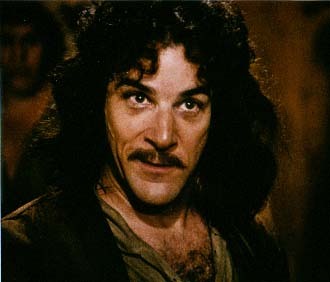 The only problem I had with him was that when he was introduced at the start as being tall, dark and having a foreign accent, I equated him in my mind with Inigo Montoya and it started getting weird when he got all romantic. The banter between characters was great – very funny at times! The writing style. Some have described it as “elegant prose” but I found it difficult to read at times. Short sentences, scenes are mostly only short snatches of action (or non-action, as the case may be), conversations that would be more at home in a more formal epic fantasy… all these things sound a little picky, but I just didn’t feel the story flowed well. Katsa. I know, she was taken and used from a young age, and most other people at the court shun her because of her Grace, but that doesn’t change the fact that now, at eighteen, she is basically a grumpy robot. The first time I felt she had any pleasant emotions in her was when she was looking after Princess Bitterblue. Even the romance seemed stilted, despite Po being quite swoony. Perhaps that’s the way it was intended, but I just didn’t really like her. The climax and ending were quite abrupt. There wasn’t even a lot of tension before it all happened – I just thought it was going to end quietly and then BAM! Okay so I’ve made it sound like I didn’t really like Graceling, but I did enjoy reading it! Kristin Cashore has written a stunning debut with a compelling story and a fascinating world. I’m hoping the storytelling style will have matured a little in the second and third books in this series so that I’ll enjoy reading them a bit more. 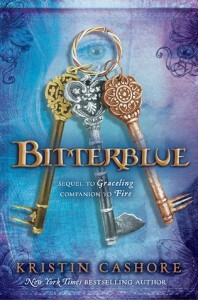 Other fans of Young Adult Fantasy have loved this book, so please don’t let me discourage you from reading it! 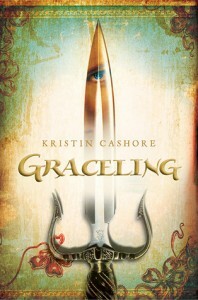 What did others think of Graceling? I agree with you on a lot of this actually. 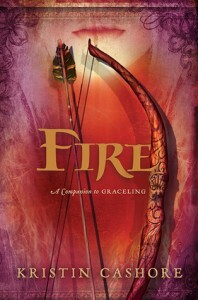 I listened to the audio of Graceling after Fire and liked it a lot less than Fire. Partially Katsa and Po just didn’t do it for me, partially the plot just didn’t flow and awesomely, partially it just seemed like a book from a newer author. I think you’ll like Fire more from what I know :). 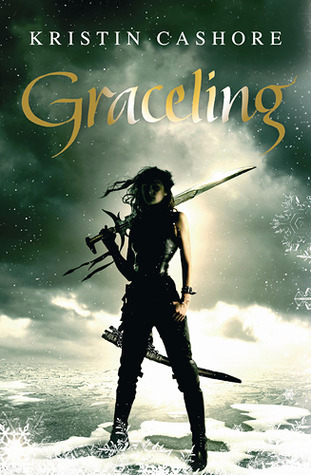 My review of Graceling should be popping up next week :D.
Man, I loved this book! I agree that the story itself isn’t that original, but I love the feminist themes. Fire was good too, and Bitterblue makes a good continuation of the series.